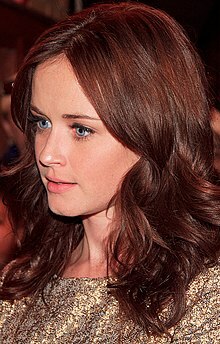 Kimberly Alexis Bledel (September 16, 1981), is an American television and movie actress. Her most notable acting is the television series Gilmore Girls. She has also been in the movies Sin City and Sisterhood of the Traveling Pants. Bledel is a Democrat and attended the 2012 Democratic National Convention in support of President Obama's re-election. ↑ "Alexis Bledel Biography". TV Guide. Retrieved 8 January 2013. This page was last changed on 7 December 2015, at 00:34.